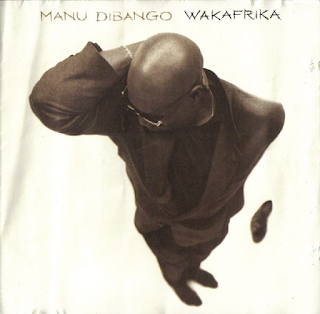 This was an album on which Cameroonian saxophonist and songwriter Manu Dibango resisted many of his old songs with the help of other "world music" artists, like Youssou N'Dour, Ladysmith Black Mambazo, Ray "Graceland" Phiri, King Sunny Ade, Salif Keita, Papa Wemba, Sinead O'Connor and Peter Gabriel. His "signature tune", "Soul Makossa", from 1972, is best known for its use on Michael Jackson's "Wanna Be Startin' Something". Here, it is given a huge, funky, bass makeover and Youssou N'Dour joins Dibango and what I think is an excellent version - fuller, warmer and slightly bassier (but not much) than the admittedly iconic original. Actually, on reflection, the original is better! Peter Gabriel's "Biko" is atmospherically covered with some portentous drums and strong vocals. The title track features some excellent jazzy saxophone from Dibango, funky, shuffling "hi life"-style drums and a sublime bass line. "Em'ma" features Mali's Salif Keita and a gloriously laid-back groove with an infectious deep-voice vocal from Dibango and Keita's trademark higher-pitched nasally Sufi-influenced vocal. It is full of intoxicating rhythms and excellent brass and guitar. Dibango's saxophone interjections are, of course, sumptuous. "Homeless" from Paul Simon's "Graceland" is given a lively, tenor saxophone-driven melodic makeover that I have to say I prefer to the slower, a capella original. Fela Kuti's Afro-Beat number, "Lady" is still dripping in Afro-Beat rhythm, but some jazzy saxophone and soulful vocals are added. "Hi-Life" is also Afro-funky, as you would expect, but again is given a real jazzy flavour, together with some gently lilting, infectious guitar parts. It is thoroughly delicious. "Wimoweh" is pretty unrecognisable from "The Lion Sleeps Tonight" refrain, it is a slow-paced groove with some ululating South African-style vocals and a thumping bass line. "Ami Oh!" is beautiful - an intuitive blend of acoustic guitars, seductive saxophone and an almost reggae skanking feel to it. Haiti's Papa Wemba adds some distinctive high-pitched vocals to it. King Sunny Ade joins Dibango for the rhythmic "Jingo" which appears based to be based loosely around the Santana song. I just checked - it is the same song. The vocals on here are African, of course. 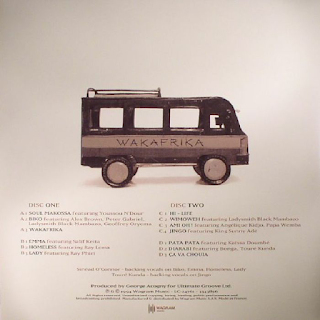 "Pata Pata" has a South African township feel about it, while "Diarabi" is full of the laid-back, wailing sounds of Mali and Senegal. It has a shuffling, insistent rhythm. The lengthy "Ca Va Chouia" has an Eastern-influenced orchestrated riff that almost has hints of Argentinian tango in its beat too. It is an odd composition, full of all sorts of styles and is certainly adventurous. For me, though, it doesn't quite work in places (although it does in others) but that doesn't detract from what has been a truly excellent, enjoyable album.